“Fatzcarraldo” sees all of Springfield’s fast-food joints go healthy, leading to Homer rediscovering the train-car chili dog place he remembers from his childhood. Except it’s also about Lisa being upset that Springfield Elementary’s school radio station is shutting down; Patty and Selma moving in with the Simpsons after getting fired from the DMV; Homer’s revelation that he bonded with the owner of the chili-dog stand because his parents used to dump him there while they went to marriage counseling; and some other odds and ends of plot. There’s a maddening lack of storytelling discipline, and it’s a shame, since there are a handful of really good jokes along the way. The problem is that, to get at the heart of the story, “Fatzcarraldo” hand-waves a lot of stuff that actually does matter. If you’re going to bring back Mona Simpson (and get Glenn Close to record a line for you), then do justice to the character, not violence. On the car ride to the therapist, Abe’s cruel to little Homer, and Mona is silent about the abuse, a far cry from the loving Mona that was so important in Homer’s life. (Mona’s and Abe’s respective ages seem off, too, for what it’s worth.) Mona might have abandoned her son (after an unfortunate bit of light terrorism), but her love for Homer formed the backbone of one of the series’ best episodes. Having her peevishly ignore him in her one brief appearance here is just sour and lazy. Lisa’s participation in Homer’s desperate final act—he steals the closed-down restaurant after Krusty buys it—is largely unmotivated by anything but circumstance. Lisa, bummed out about the radio station, is brought to the caboose for a cheer-up chili dog. She’s a vegetarian, but it’s the gesture that counts. When Homer goes on the lam, Lisa’s with him, and that’s that. Like Homer’s story, though, Lisa’s truncated radio adventure has some very funny ideas tossed here and there. I’m a sucker for competent, driven Lisa, and her hard-boiled investigative report of Springfield Elementary’s criminal element sees her rattling off a fine list of supposed detention nicknames, like Prankatraz, The Skinner Sheraton, Spitball Alley, The Bully-Pen, 3:11-Worth, Little Devil’s Island, and Dead Man Chalking. And her in-depth interview with school bully Nelson gets him to reveal the origins of his signature, mocking “Haw-Haw!” (“I guess I wanted to make a dope feel like a dingus.”) Lisa also introduces Nelson as “the legendary Nurple Purpler,” which made me laugh out loud. But, in a cluttered episode, this half-realized B-story combines with a half-realized A-story to make not much of an impression at all. Speaking of clutter: Homer makes an elaborate dominoes game out of pizza boxes at the nuclear plant, Mr. Burns mocks up a fake “guess how many buttons” contest to clear out the plant so he and Smithers can hide some bodies, a lot of time is spent on Krusty’s clown car full of lawyers, and an even longer time is spent on a static gag about Comic Book Guy and the rest pulling the caboose up a very, very long hill. 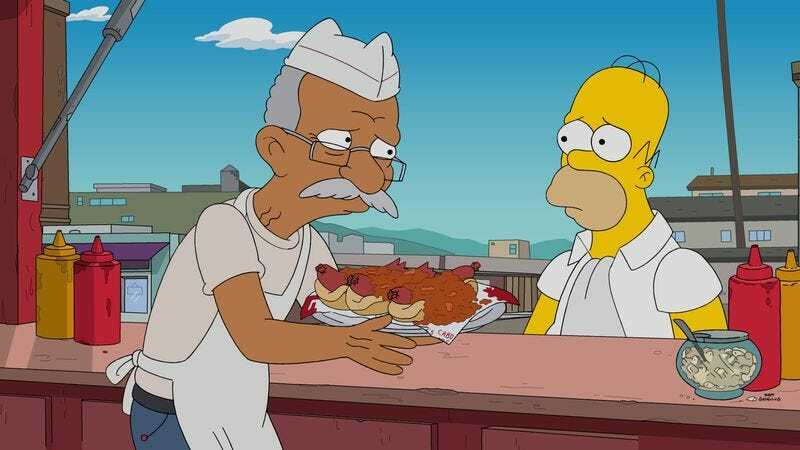 Oh, and while Krusty Burger’s healthy transformation is explained by an Asian buyout, the whole “Springfield eats healthy” subplot is just dropped. There’s one funny joke, however, where Homer’s horror at the changed over “Tofu Bell” and “Kentucky Steamed Soybeans” is capped off when he screeches, horrified, past an Arby’s. Unlike what was perhaps feared from the rap-themed, super-sized episode last time, we actually do get a little bit of rapping Homer here. It’s pretty innocuous. 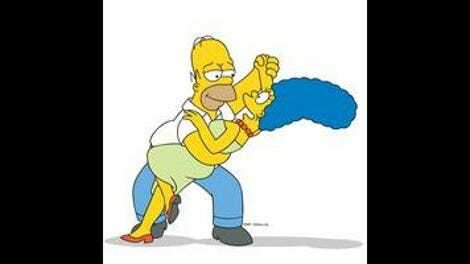 The episode is dedicated to Simpsons animator Sooan Kim, who died in January.